Margaret of Anjou (1430–1482) was the daughter of René, Duke of Anjou (also Duke of Bar, Lorraine, Calabria, Count of Provence and Piedmont, and titular King of Naples, Sicily and Jerusalem), and wife of King Henry VI of England. She issued her Charter to establish the Queen’s College of St Margaret and St Bernard on 15 April 1448, the same day as the foundation stone was laid by her chamberlain. Her heraldic arms, derived from those of her father René, became the basis of the Arms of Queens’ College. The connection with her is remembered in the name of the Angevin Room at Queens’. As far as is known, Margaret did not sit for a formal portrait during her lifetime, so we have no images of her that we know to have been intended to be life-like. We have various other images purporting to be of her, but we do not know for sure to what extent they were life-like, or whether instead they were merely images of symbolic queens given her name. The image above is a detail of f. 2v. from British Library Royal MS 15 E VI, the Talbot Shrewsbury book , 1444–45, a collection of fifteen romances, chivalric treatises, instructional texts, chronicles and statutes compiled as a gift to Margaret of Anjou, on her betrothal to Henry VI, from John Talbot, the 1st Earl of Shrewsbury, who escorted her to England for the marriage in 1444. She is depicted holding the hand of King Henry VI, receiving the book from John Talbot. In the Schools Court of the University Old Schools, an arched doorway at the south-west corner has two corbels reputed to be of King Henry VI and Margaret of Anjou. Henry appears to hold a scroll (at bottom of picture, left); Margaret appears to hold a short sceptre. These stones, of unknown date, are not in their original locations: they might have been part of the original buildings of King’s College (founded by Henry VI) before they were absorbed by the University Old Schools. This image of Margaret at prayer and of her Coat of Arms is a detail from a prayer-roll made for Margaret ca 1445–55, now in the archives of Jesus College Oxford as MS 124. Her Arms are shown quartered with those of England. For more, see Beyond Private Matter: A Prayer Roll for Queen Margaret of Anjou by Sonja Drimmer in Gesta Vol. 53, No. 1 (March 2014), pp. 95–120. This image is Copyright © Jesus College Oxford; reproduced by kind permission. Cette figure est aux Vitres des Cordeliers d’Angers. Elle est de Marguerite d’Anjou fille du Roy René, femme de Henry VIe, du nom Roy d’Angleterre, mariee en 1444, morte en 1482. The glass is dated to the period 1454–60 [ Le Roi René et la seconde maison d’Anjou , by Christian de Mérindol, Plate XLI], making Margaret 24-30 years old. At that time, Margaret was Queen of England, and unlikely to have been seen by the artist. Sur les mêmes vitres est … Marguerite d’Anjou fille du Roi René, qui fut mariée en 1444. à Henri VI. Roi d’Angleterre. Elle se porta fort courageusement dans les disgrâces du Roi son mari, qui fut détrôné, remis sur le thrône & enfin tué. On voit ici l’écusson d’Angleterre, parti de tous les quartiers du Roi René son pere. Bernard de Montfaucon seems to have been in error in referring to the chapel as being dedicated to St Bonaventure, rather than St Bernardin. After Henry fled to Scotland in 1461, Margaret stayed for a while with her father in France. While she was with her father at Bar-le-Duc in 1463, a celebrated Milanese medalist, Pietro di Martino, made this large portrait medal of her, 8.5 cm in diameter. This is probably a likeness of her at the age of 33. Image Copyright © Victoria and Albert Museum. Imbued with courage she shines · May you be styled shrewd! Henry VI (left) and Margaret (right) kneeling, accompanied by their patron saints George and Margaret standing (each with their dragon), before God the Father holding Christ on the Cross. This is a detail from a coloured drawing on f.8*v of British Library MS Harley 318. An illumination from the manuscript Vigiles de Charles VII , by Martial d’Auvergne, ca 1475–1500, depicting the marriage of King Henry VI with Margaret of Anjou. This is a purely conventional representation of a royal marriage, and no likenesses can be read into it. From the Bibliothèque nationale de France, MS Français 5054. This image is a detail from the tapestry, dated roughly 1500–09, in St Mary’s Guildhall, Coventry, reputed to be of Margaret of Anjou, wife of King Henry VIth, at prayer, with the women of her court behind. This is likely to be merely a conventional representation of a queen, rather than a likeness of Margaret. Several later prints entitled Margaret of Anjou are derived from this source, or incorporate the costume design shown here. Liddy, C. D. (2012) Urban politics and material culture at the end of the Middle Ages : the Coventry tapestry in St Mary’s Hall , Urban History, 39 (2), pp. 203–224. Margaret wife to Henry ye sixt. Amongst these worthyes Margaret may claime right. Of mighty spirit, Although unfortunate. The prints, without the verses, were re-published in The exemplary lives and memorable acts of nine of the most worthy women of the world , by Thomas Heywood, 1640. This image is National Portrait Gallery D32778, Queen Margaret of Anjou after Unknown artist. Licensed CC BY-NC-ND 3.0.
et istius Coll: Præsidenti Humillime Dicat J. Faber. 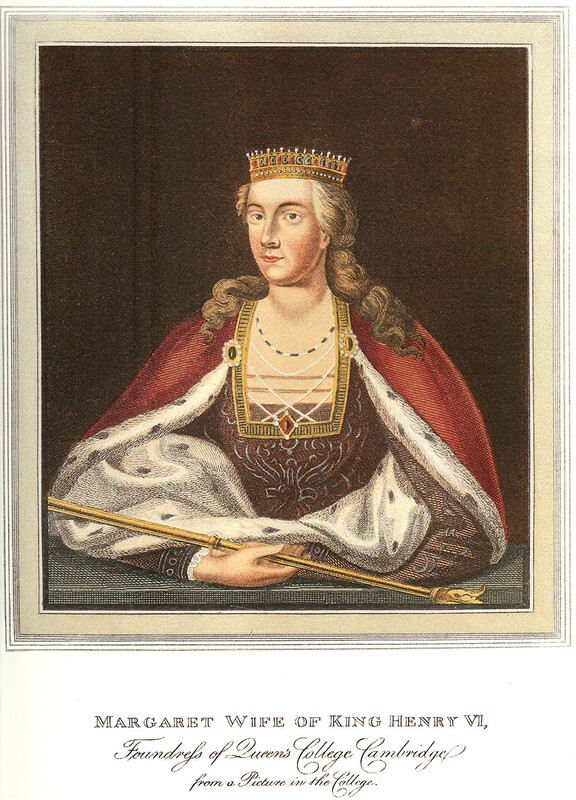 Margaret, Wife of Henry VI, 1st Foundress of Queen’s Coll. Cambridge AD 1446. J. Faber most humbly offers this image to the Revd H. James, Regius Professor of Divinity and President of that College. This image is National Portrait Gallery D9414, Called Queen Margaret of Anjou by John Faber Sr, after Unknown artist. Licensed CC BY-NC-ND 3.0. Cant: 1 Fund.x A.D. MCCCCXLVI. This image is National Portrait Gallery D9406, Called Queen Margaret of Anjou after Unknown artist. Licensed CC BY-NC-ND 3.0. This painting was acquired by Horace Walpole for Strawberry Hill in the early 1750s. He mistakenly believed it to represent the Marriage of Henry VI with Margaret of Anjou. [ Anecdotes of Painting in England , by Horace Walpole, Vol. 1, Ch. 2] The mis-attribution was corrected in the 19th century, but not before the figure of the bride had been used as the model for prints entitled Margaret of Anjou, and the painting itself reproduced in prints as The Marriage of Henry VI, still widely circulated under their false identities. In 1842, John Gough Nichols rejected Walpole’s attribution, asserting instead that the painting was a Sposalizio, a representation of the bethrothal or marriage of the Virgin Mary with St Joseph. [ The Gentleman’s Magazine , New Series Vol. XVIII, 1842 July, pp. 17–18], [ Notes and Queries , 3rd series, Vol. X, 1866 July 28, p. 61], [ The Athenæum 754, 1842 Apr 9, p. 318] However, although the painting has the traditional form of a Sposalizio, the groom looks rather young for Joseph, the common iconography of a blossoming rod is absent, and it is curious that the groom has a nimbus while the bride does not. For more on this painting, see: The prime minister of taste : a portrait of Horace Walpole , by Morris R Brownell, 2001, pp. 98–101 (ISBN 978-0-300-08716-1). An enlarged detail of the bride from the painting above, for comparison with the portrait below entitled Margaret, Wife of King Henry VIth in the collection of Queens’ College, and with the Harding print below. Pay attention particularly to the decorative motif of the fabric of the dress, and the detailed design of the coronet and the colours of its jewels. 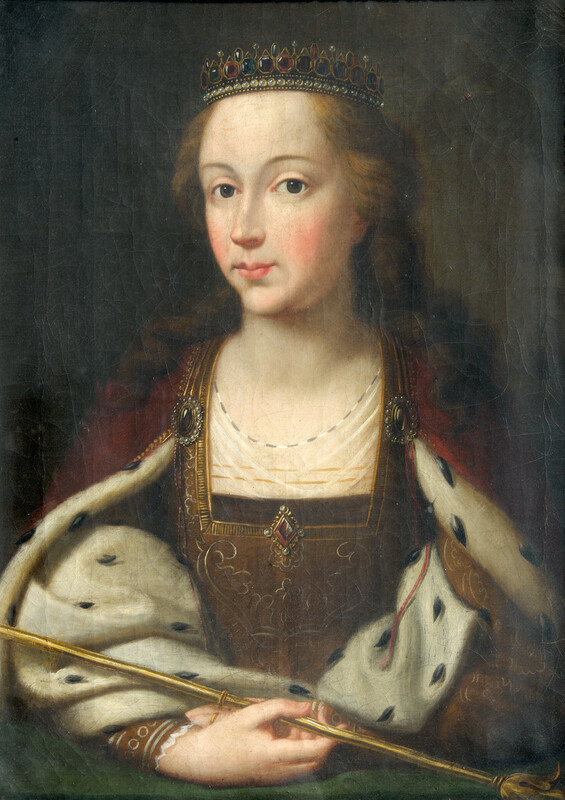 This portrait, in the collection of Queens’ College, is entitled MARGARET, WIFE of KING HENRY the VIth . In 1790, this portrait was attributed to Freeman . [ A catalogue of the several pictures in the public library and respective colleges, in the University of Cambridge , 1790, p. 19] Joseph Freeman (d. 1799) was a Cambridge surveyor and land-agent, and also a self-taught copyist in oils. Queens’ used him as an estate surveyor, and several colleges used him as a copyist of portraits. [ Iconomania in Eighteenth-Century Cambridge , by Gerald Robert Owst, in Proc. Cambridge Antiquarian Society , Vol. XLII (1949):67–​91, at p. 80. (ISSN 0309-3603)] The fact that many portraits around Cambridge of historical persons were copies by Freeman would have been common knowledge at the time of the 1790 catalogue. However, the 1790 catalogue was incorrect in this case. On the back of this painting’s frame is painted the note Copied by R: Davy London 1775 , together with a paper label bearing the address 41 Charlotte Street, Rathbone Place . Robert Davy (d. 1793) was listed as being from 41 Charlotte Street, Rathbone Place in the catalogues of the Royal Academy Exhibitions of 1775 and 1776. [ The Royal Academy of Arts : A Complete Dictionary of Contributors and their works … , by Algernon Graves, 1905, Vol. 2, p. 271] So we can be reasonably secure in attributing this work to Robert Davy. The signature and label show signs of having been papered over at some point, and revealed again later: it is therefore possible that they might not have been visible at the time of the 1790 catalogue. In this image, the supposed queen’s coronet and dress pattern are identical to those of the bride (above) in the painting mistakenly believed by Horace Walpole to be The Marriage of Henry VI with Margaret of Anjou: only the pose, hair style, and cape are different. So it appears that this portrait in Queens’ College is derived from the bride in the bogus Marriage of Henry VI at Strawberry Hill (see above). We shall probably never know whether Davy’s copy was taken directly from Walpole’s painting, or whether Davy copied some intermediate version, now lost, descended from Walpole’s painting. Davy cannot have used prints of Walpole’s painting as a source, because (a) none of the prints available in 1775 have the necessary detail of the decorative motif of the dress; and (b) the colours (e.g. of the dress; of the jewels in the coronet) are correctly rendered. A mistake by the copyist is that the attachment clasps for the cape have been moved upwards, but the two horizontal laces (which ran between the clasps in the original) have remained lower down, at their original position. In 1815, Ackermann published a coloured print of this portrait: see below. Sergent del. 1787 Ridé sculp. née le 23 Mars 1429; morte le 25 Aoust 1482. A Paris, chez Blin, Imprimeur en Taille-Douce, Place Maubert, N.o 17, vis-à-vis la Rue des 3 Portes. A.P.D.R. This image is taken from the Bibliothèque nationale de France. From an Ancient Picture in the Collection of the Right Honourable the Earl of Orford at Strawberry Hill. Pub. Feb.7, 1792, by E. Harding Fleet St. This print is an apparently accurate mirror-image of the bride in the painting at Strawberry Hill that Horace Walpole (Earl of Orford) mistakenly believed to be The Marriage of Henry VI with Margaret of Anjou (see above), so the labelling of this print as MARGARET, Queen to King Henry the Sixth is also equally mistaken. This print was re-published in Shakespeare illustrated by an assemblage of portraits , Vol. 1, Plate 39, by the Harding brothers, 1793, and was the source for a modified version used as a frontispiece to The Life and Times of Margaret of Anjou … , by Mary Ann Hookham, 1872, Volume 1. 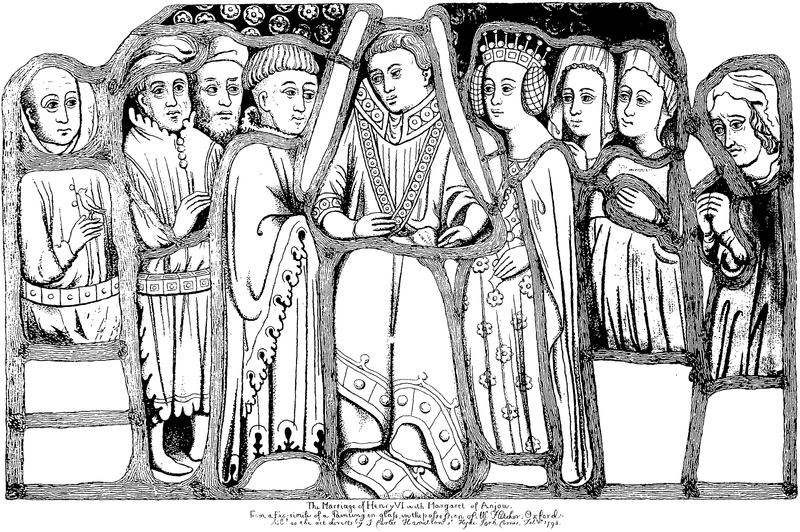 The Marriage of Henry VI with Margaret of Anjou. From a Fac-simile of a Painting on glass, in the possession of W. Fletcher, Oxford. Pubd. as the act directs by J. Carter Hamilton st Hyde Park Corner, Feby. 1st. 1793. It was published in Specimens of the Ancient Sculpture and Painting, now remaining in this Kingdom , by John Carter, Volume 2, ca 1794. But even the accompanying text [ibid., Vol. 2, pp. 49–50] by Richard Gough, has doubts about the attribution, the costumes being of an earlier period. The attribution might have been a case of wishful thinking, driven by the Strawberry Hill painting [above], which itself later turned out to be a false attribution. The glass was said to originate in Great Rollright church, Oxfordshire, and was donated by Alderman William Fletcher to the Bodleian Library Oxford in 1797 [ Annals of the Bodleian Library , by William Dunn Macray, 1868, pp. 29–30]. The remains of the glass, somewhat altered, can still be seen there. For more, see: A Sacred or Royal Marriage? The Identification of Fifteenth-Century Stained Glass from Great Rollright , by Christine Peters, in Oxoniensia , Vol. LVII, 1992, pp. 354–5 [ISSN 0308–5562]. 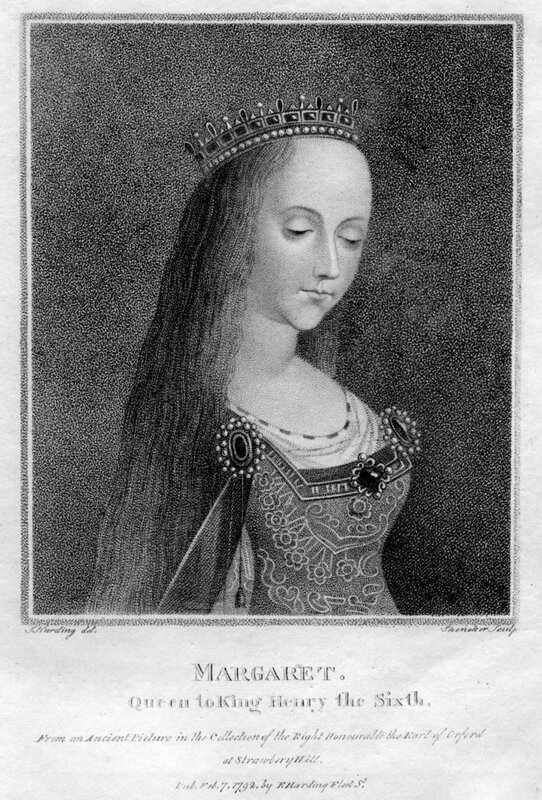 An imaginary Margaret of Anjou, published by Edward Harding 1 June 1801. Clearly based on the 1714 image above, with some jewellery removed. Re-published in Memorabilia Cantabrigiæ: or, An Account of the Different Colleges in Cambridge , by Joseph Wilson, of Inner Temple, 1803, as an illustration of the foundress of Queens’ College. Margaret of Anjou, Queen to King Henry the 6th. Pubd Augt 1811 by Colnaghi & Co. 23,Cockspur Street, London. The designs of the five costumes shown are taken from five examples, including Queen Margaret, in the tapestry (above) at St Mary’s Guildhall, Coventry. Drawn by Charles Hamilton Smith, etched by John Augustus Atkinson, aquatinted by J. Mérigot, published 1814 by Colnaghi & Co. in Selections of the Ancient Costume of Great Britain & Ireland , by Charles Hamilton Smith. (OCLC 24616557). This image is © Mary Evans Picture Library/Alamy Stock Photo. from a Picture in the College. Another imaginary Margaret of Anjou, again taken from the 1714 print above. Published 1825 in the Universal Historical Dictionary , by George Crabb, Volume 1, Plate 6. Engraved by J.W. Cook. The figure of Margaret is a mirror-image of her appearance in the Colnaghi print of 1811. Print by Luigi Giarré and Vincenzo Stanghi. Published in Il costume antico e moderno…Europa , by Giulio Ferrario, 1826, vol. 7, pt. 1, plate 10, p. 69. Two prints of Margaret, unmarried on the left, as Queen on the right, in The Shakespeare Gallery: containing the principal female characters in the plays of the great poet , by Charles Heath, ca 1836. Both drawn by John Rogers Herbert, engraved by William Henry Mote. Two versions of Marguerite d’Anjou, published in Le Plutarque Français , by Édouard Mennechet, Vol. 2. Drawn by Claude Jacquand, engraved by Leclerc. The upper part of her costume is derived from drawings of the glass in the chapel of St Bernadin at the church of the Cordeliers d’Angers (see above); the remainder is fictional. MARGARET, QUEEN OF HENRY 6TH AND HER COURT. From the Tapestry in St Mary’s Hall, Coventry. It was published in Costume du Moyen âge d'après les manuscrits, les peintures et les monuments contemporains , by Jacques Joseph Van Beveren, 1847, Volume 2, p. 47. The fictitious Margaret of Anjou from 1714 appears yet again, minus strings of pearls, plus a waving hand, in The Pictorial History of England , by George Lillie Craik and Charles McFarlane, Vol. 2 (Books 5 & 6), 1847. This image re-appears in Margaret of Anjou , by Jacob Abbott, 1861. Two prints of Margaret, unmarried on the left, as Queen on the right, in The Heroines of Shakespeare: comprising the principal female characters in the plays of the great poet , by Charles Heath, 1848. The left-hand Margaret drawn by John William Wright and engraved by William Henry Mote. In later editions of this work, by De Lay Glover, this image is re-titled to be Lady Northumberland, not Margaret. The right-hand Queen Margaret drawn by John William Wright and engraved by B. Eyles. The costume is based on that in the Coventry tapestry above. Another engraving of the same drawing was made by D.L. Glover. An imaginary Margaret of Anjou, drawn by A. Bouvier (possibly Augustus Jules Bouvier? ), engraved by W. Joseph Edwards, published 1851 in Biographical Sketches of the Queens of Great Britain from the Norman Conquest to the Reign of Victoria: or, Royal book of beauty , by Mary Howitt. Remarkably, nearly every queen illustrated in this book has the same round-faced features as Victoria. 2. Les Étoiles du monde: Galerie historique des femmes les plus célèbres de tous les temps et tous les pays … Dessins de G. Staal. Gravés par les premiers Artistes anglais , Paris, facing page 155. The design of the dress, head-dress, and jewellery seems to owe something to the Sergent/Ridé print of 1787. King Henry VI and his wife Margaret, in the foreground on the right, taken from Plate 53 of Die Trachten der Völker , 1864, drawn by Albert Kretschmer, text by Carl Rohrbach. Margaret (seated) appears in costume modelled on the tapestry at St Mary’s Guildhall, Coventry (see above). Two reproductions of an illumination in the Roll of the Fraternity of Our Lady, of the Skinners Company of London, celebrating Margaret being enrolled into the Fraternity in 1475. By this time she had been emprisoned for three years after her overthrow and the deaths of Henry VI and their son. Left: from Some Account of the History and Antiquity of the Worshipful Company of Skinners, London , by James Foster Wadmore, 1876. Right: from Some Account of the Worshipful Company of Skinners of London , by James Foster Wadmore, 1902. The Qween Margarete su̅tyme wyff and Spowse to kyng Harry the sexthe. Margaret of Anjou, depicted in stained glass at Mucklestone Church, by Charles Eamer Kempe, ca. 1890-1905. The design of the necklaces, at least, is taken from the tapestry at St Mary’s Guildhall, Coventry (see above). She is shown holding daisies (or marguerites, her name in French), and her dress has a daisy pattern. A fictional portrait, intended to represent Margaret of Anjou, made for the television series The White Queen, in 2013. Her costume appears to be based on the illumination from the manuscript Vigiles de Charles VII , by Martial d’Auvergne (see above), but the general composition (including hands, cuffs, hat, veil) is based on portraits of Elizabeth Woodville. The image on the left self-identifies as being of Marie d’Anjou, sister of René, who became Queen of France. The image on the right incorrectly claims to be Marguerite d’Anjou. Furthermore, no image resembling this can be found in any Book of Hours associated with René. This bogus image appeared in King René and his Seven Queens , by (John) Edgcumbe Staley, 1912. Worse was to come, as this bogus image was copied, with its false attribution, in Henry VI , by Bertram Percy Wolffe, 1981, republished 2001, with the description Margaret of Anjou, René’s daughter, painted by him in his Book of Hours. In 1904, it was proposed by William George Thomson (1865–​1942), on the slimmest of evidence, that this detail, from Falconry , one of the Devonshire Hunting Tapestries, was a depiction of Margaret of Anjou [ The Second Panel of the Hardwicke Hunting-Tapestries , by W.G. Thomson, in Art Workers’ Quarterly , Vol. 3, No. 9, January 1904, pp. 1–​7 (OCLC 192398994)]. Thomson repeated this attribution in his book [ A History of Tapestry… , by W.G. Thomson, 1906 p. 179, 2nd ed. 1930 pp. 154–​160. (OCLC 1635558)]. In 1950, the Times newspaper ran an article on the Falconry tapestry after cleaning, including a photograph of a detail believed to be that of Margaret of Anjou [ Tapestries at French Exhibition , in The Times , No. 51625, 1950 February 25, p. 10 col. 4 (ISSN 0140-0460)]. The Times article caught the attention of certain members of Queens’ College. The result was a double article in The Dial magazine for Easter Term 1950 claiming this as a newly-rediscovered depiction of the first foundress of the college. The authors went on to identify another figure in the tapestry as being René of Anjou, father of Margaret [ Princess Margaret of Anjou , by Charles Theodore Seltman, in The Dial , No. 101, 1950 Easter, pp. 9–​11; Notes on the Illustrations , by (Norman) Anthony Neville (1927–), ibid., pp. 12–​14. (OCLC 265448755)]. The above claims were repeated in a published history of the college [ A Pictorial History of … Queens’ College Cambridge , by A.D. Browne & C.T. Seltman, 1951, Plate 2. (OCLC 7790464)]. A new account of the origin of the tapestries was put forward in 1988: the couple in this detail were identified as John Talbot, 1st Earl of Shrewsbury, and his second wife Margaret Beauchamp [ The sign of the dog: an examination of the Devonshire hunting tapestries , by Ann Claxton, in Journal of Medieval History , Vol. 14, No. 2, 1988 June, pp. 127–​78 (ISSN 0304-4181 eISSN 1873-1279)].